Walmart is either playing it super safe, or it knows something we don’t. The retail price of the Nintendo Switch is still a mystery. It’s a mystery that pundits and inside sources have more less pinned down, but nothing is ever confirmed until it’s official. 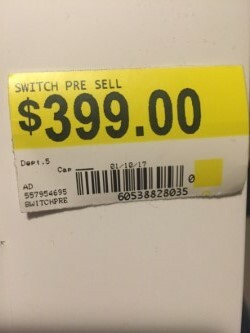 A picture of a pre-order sticker for the Switch at US retailer Walmart made its way to Reddit earlier. It shows the price being $399, which is way higher than any of the previous estimates. The Reddit user who posted it said he works at the retailer, and although the sticker has yesterday’s date, the image is of a very low quality and could be a fake. Most recently, Japanese financial paper Nikkei said the console will sell for around $250. The magazine revealed accurate information about the Japanese games industry many times before, and the price is more in line with previous leaks. What’s likely to happen is that Nintendo will release different SKUs at different price points, depending on how many games are included or if other accessories will be part of the package. That said, $400 is too high a price for what the Switch is supposedly capable of, at least when it comes to raw power. There’s a near slim chance Nintendo will sell the console for more than what you can currently pay for PS4 and Xbox One, even if it comes with a couple of games.